In one Fair Park zip code, more than 4 of 5 households sit in poverty or a bad break away. It's the most poverty stricken zip code in any of Texas' large cities. Dallas’ economic segregation is on full display within data released by the United Way of Texas last week. We’ve known about the stark contrasts in poverty rates from one neighborhood to the next. But United Way’s new study goes a step further, applying numbers to the combination of low wages and little or no savings that put families just an emergency away from extreme need. 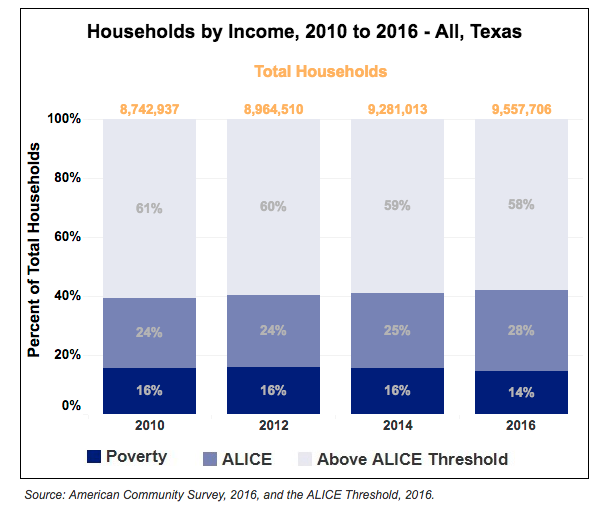 The Texas ALICE Report—with ALICE denoting “Asset Limited, Income Constrained, Employed” families—shows that in some of our neighborhoods, as many as four out of five families toil along in poverty or are dreadfully close. In the 75210 zip code of Fair Park, 83.3 percent of families exist in this category. That’s the highest of any zip code inside one of Texas’ five largest cities. To compile the statistics, United Way pulled information from the American Community Survey, with the most recent data coming from 2016. In Red Bird’s 75237, the number is 78.1 percent. In 76216, which touches a patch of southern Dallas between I-35 East and I-45, the number is 76.7 percent. From the Cedars south along Lamar Street to William Blair Park—zip code 75215—the number is 73.8 percent. West Dallas’ 75212 is represented here, as well, with its rate sitting at 71.7 percent. Overall, seven Dallas County zip codes are above 70 percent, and in 37 zip codes, at least half the households meet the threshold. Taken as a whole, the numbers are emblematic of the deeply engrained economic patterns of our city. They show the racial segregation that runs alongside economic segregation, which can be traced all the way back to practices like redlining. We’ve covered in this space the economic realities faced by too many people of color. Rev. Dr. Michael Waters spoke to that on the most recent EarBurner. It’s unsurprising that all seven of the aforementioned 70-percent neighborhoods are predominately minority, save for the tiny Northwest Dallas zip code of 75247, which encompasses just 217 households with a population that is about half white. We’ve discussed how all of this impacts things like education and health. Wide swaths of our city is in peril, even as cranes continue to dot our skyline and one major corporation after another selects DFW for relocation. The ALICE report tells us that 269,000 of the county’s 925,000 households are an emergency away from poverty, while about 132,000 are already there. We’re left with a mayoral race that needs to address ways to bring more of those homes into the benefits of our city’s growth. Across the state, about 42 percent of households are in poverty or meet the ALICE threshold. The report works off a “household survival budget,” taking into account things like housing, healthcare, child care, and transportation. The average survival budget for a household in Texas is about $53,000, compared to the federally recognized poverty level—which the United Way calls outdated—of $24,300.